Often it is difficult to slip beads on a cable because of a plug or connector. Split beads solve this problem. They come in two halves that fit over the cable. A plastic snap cover holds the two halves together and holds the assembly on the cable. 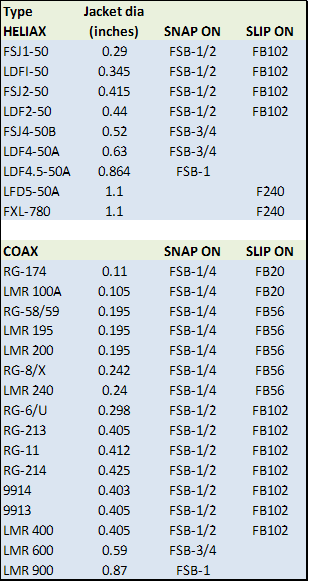 For RFI use, mix 31 is effective from 1-300 MHz, mix 43 works from 25-300 MHz, Mix 61 is for 200-2000 MHz, and mix 75 favors .15-10 MHz. These frequencies are those of the interfering signal to be eliminated, not the operating frequencies of the equipment to be protected. Not sure of what sizes you need or solving a RFI problem with devices using multiple size cables? Try the Ferrite Snap On Combo Pack which has sizes from 1/4″ to 3/4″ with either Mix 31 (1-300 MHz) or Mix 61 (200-2000 MHz) or Mix 75 (100 KHz – 10 MHz). Shown below in the table are the SLIP ON and SNAP ON products for various popular Heliax and Coax cables. These are the correct size for making sleeve chokes – See above table for technical details.